Orbitz Platinum members receive free room upgrades and Platinum and Gold members get other perks upon availability at check-in. Located in Midtown, The Belvedere Hotel is within a 5-minute walk of Eugene O'Neill Theatre and within 15 minutes of other popular attractions like Gershwin Theater. This 355-room, 3.5-star hotel has a restaurant along with conveniences like a 24-hour fitness center and a 24-hour business center. Enjoy a leisurely bite to eat at the onsite restaurant, or have a drink at the bar/lounge. Savor a meal from the privacy of your room with room service, or get a pick-me-up at the coffee shop/café. For your convenience, a continental breakfast is served for a fee each morning from 7:00 AM to 10:00 AM. Guests can expect to find an LCD TV with cable channels. The bathroom offers hair dryers and free toiletries. Other standard amenities include a kitchenette, a refrigerator, and a microwave. Guests of The Belvedere Hotel enjoy a 24-hour fitness center, free WiFi in public areas, and a 24-hour business center. Valet parking is available for USD 55.00 per day. The 24-hour front desk has multilingual staff ready to assist with concierge services, dry cleaning/laundry, and luggage storage. Additional amenities include a computer station, express check-out, and laundry facilities. Located at the edge of the Theater District, this Midtown New York City hotel is two blocks from Times Square and three blocks from Rockefeller Center. The Belvedere's 24-hour business center has four computers with high-speed Internet access (surcharge) and a printer (surcharge). A complimentary 24-hour fitness center contains cardio machines, a weight machine, and free weights. A laundry room has coin-operated machines. The hotel offers a full-service concierge. 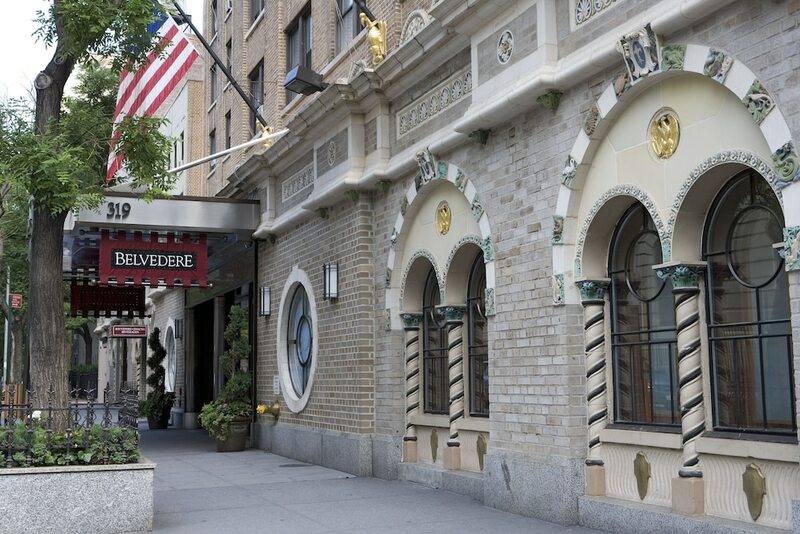 The Belvedere Hotel offers 355 air-conditioned accommodations with safes and hair dryers. Accommodations at this 3.5-star hotel have kitchenettes with refrigerators and microwaves. Bathrooms include shower/tub combinations and complimentary toiletries. LCD televisions come with premium cable channels. Business-friendly amenities include desks and phones. Additionally, rooms include irons/ironing boards and blackout drapes/curtains. Housekeeping is provided daily. Churrascaria Plataforma - This renowned Brazilian "rodizio"-style steakhouse is open daily. Master rotisseurs carve succulent cuts of roasted beef, lamb, pork, and other fine meats tableside. The Churrascaria Plataforma's extensive wine collection serves as the perfect accompanimen. A spectacular salad bar and many Brazilian delights are also prepared fresh daily. Belvedere Café - Open daily for breakfast (7-10 AM), offering guests a continental buffet breakfast (surcharge). Central Park, 11 blocks north of this New York hotel, offers a variety of recreational opportunities, including ball fields, tennis courts, rowboat rentals, horseback riding, and miles of trails for hiking, biking, running, and in-line skating. Rockefeller Center's famed skating rink, three blocks east, opens in winter, as does Central Park's Wollman Rink. For a service fee, parcel deliveries will be accepted up to 3 days prior to arrival for guests. The property cannot be held responsible for lost or damaged goods. For more details, please contact the property using the information on the reservation confirmation received after booking. Book a stay in any room or rate category and receive the following included in the paid resort fee: 50% off daily continental breakfast (breakfast rate: USD 14 per person plus tax with discount USD 7 per person plus tax); concierge services; free local calls; free package receiving; nightly wine hour (5-6 PM); 15% food credit for Churrascaria Plataforma; complimentary printing services; and 20% off Grayline City-Sightseeing: all-around-town double-decker bus tour package; single loop double-decker tours (downtown and uptown). Book a stay in any room or rate category and VIP members receive complimentary continental breakfast (Premium Elite only) and a room upgrade.